State-Society Relations in the Kurdistan Region of Iraq: A Mythical Abstraction? 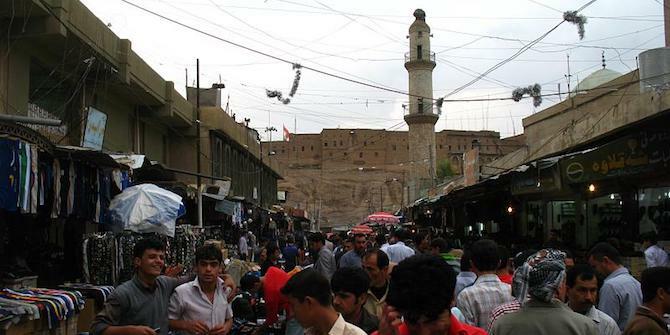 The Kurdistan Region of Iraq defies easy categorisation and demonstrates various paradoxes. Since 2005, it has been officially recognised as an autonomous region in the Iraqi constitution; but in the aftermath of the 2017 referendum on independence, the Kurdistan Regional Government (KRG) lost much of its autonomy, and furthermore its territory. KRG officials have pursued neoliberal policies of privatisation seeking to attract foreign investment; but the regional economy remains almost completely cash-based and largely isolated from globalised and digitalised financial flows. Finally, in the run-up to the referendum, there was much talk of defending Kurdish freedom with one’s own blood; but when the Iraqi army, backed by Shi’ite militias, marched on the disputed territories in Kirkuk, Ninewa, and Sinjar regions, Kurdish military forces, or Peshmerga, withdrew virtually without a fight. To the extent one can talk of the KRG as constituting a ‘state’ (or a ‘quasi-state,’ as it has also been called), it is indeed a paradoxical one. It is a ‘strong state’ in that it has a strong repressive and redistributive apparatus, and until recently had vast financial means at its disposal; but it is a ‘weak state’ in that it knows little institutionalisation, let alone international recognition. The region employs no military service or standing army: the Peshmerga forces are professional (and semi-private) militias mostly consisting of older men. Nor can one easily speak of a Kurdish ‘society’ as distinct both from the state and from the ruling parties. A solid majority of the work force is employed by the KRG, and hence directly dependent on those in power. They are no ‘bourgeoisie’ in the classical sense, however, since they have no clear role in any productive process and are entirely dependent on the ruling elites. Most civil society organisations are created, and dominated, by the political parties, rather than reflecting grassroots or bottom-up self-organisation. Local youth have grown up in a consumerist environment, in which employment and income were seen as entitlements. Even long-standing ideals of masculinity and femininity, like that of the heroic Peshmerga defending Kurdish freedom with his life, are starting to lose their appeal. Thus, it is as problematic to speak of a ‘society’ in Iraqi Kurdistan as it is to talk of a ‘state.’ Hence, the term ‘state-society relations’ may not the best analytical tool for understanding local dynamics, since few if any of the Kurdish parties appear to accept the legitimacy of the distinction or separation between the two. This unwillingness reflects one of the enduring features of the Kurdish political landscape: the Leninist desire for the party apparatus to pervade and dominate both the state apparatus and societal organisations. Next to this Leninist vanguardism, another enduring feature of the region is the Stalinist personality cult around the political leaders. Instead of distinguishing between social institutions presumed to be legitimate and relations of patronage assumed to be informal and unstable, one may instead focus on tactics or technologies of government, and on questions of self-legitimation rather than legitimacy. A primary governmental tactic, obviously, is patronage, which is pervasive and by now solidly entrenched in the region. Patronage involves the creation of dependency; hence, until recently, relatively few open protests could be seen against the KRG’s corruption, the failure to pay salaries and other forms of mismanagement. Most protests, in fact, were located in Sulaimaniyah area, where there is no clear one-party rule: not only is the KDP traditionally weaker here, but the PUK has also been weakened by the breaking away of Goran and by infighting among its different factions. A second governmental tactic is surveillance and repression. The elites of both governing parties have extensive security apparatuses at their disposal, which sometimes amount to virtual private militias, and which harshly attempt to suppress all actual or potential opposition. A third tactic is the control of information. Official TV channels broadcast a steady and uninterrupted flow of propaganda, for example, consistently repeating the narrative that the fiasco of the 2017 referendum was due to ‘treason’ rather than to the errors of the Kurdish leadership. The oppositional press risks heavy fines, or in a number of cases the intimidation, maltreatment or even assassination of opposition journalists. This is not to say, of course, that these tactics are always successful. At the time of writing, open protests against the KRG appear to be on the rise in the entire region. In March of 2018, there were open demonstrations against the KRG’s inability to pay salaries even in KDP heartlands, where until recently protests were almost unheard of. Most of these demonstrations were violently repressed; but it is doubtful how long those in power can maintain using the stick of their security forces to govern, now that they have largely lost the carrot of salary payments. This is part of the proceedings of a workshop on Iraq and its Regions: The Future of the Kurdistan Region of Iraq after the Referendum, held at the LSE on 16 March 2018. See below for the full list of papers. Michiel Leezenberg teaches in the Philosophy Department and in the program Islam in the Modern World in the Faculty of Humanities of the University of Amsterdam. Among his research interests are the Kurdish question and the intellectual history of the early modern and modern Islamic world.